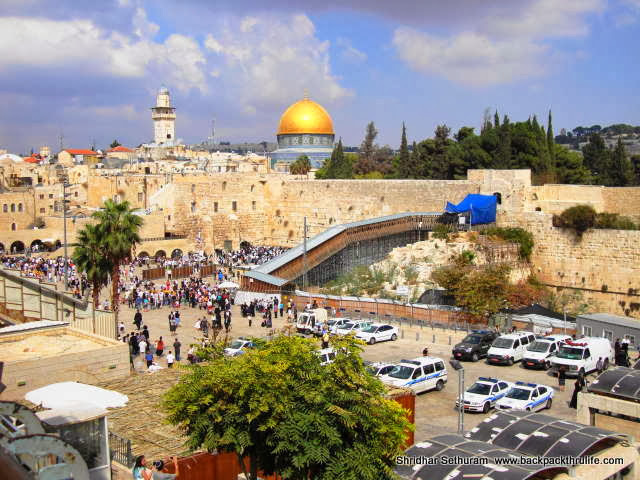 The Holy Land: Jerusalem is considered as the Holy Land by Jews, Christians and Muslims. There are few places in the world that bring together people from different faiths. The city is important to the Jews, as legend has it was here that Abraham nearly sacrificed his son Isaac but was commanded by God not to do so. The Christians believe that this was where Christ preached, ate the Last Supper with his disciples before his death and was crucified and then resurrected. Jerusalem is key to the Muslims as it is believed that Muhammad’s nocturnal spiritual journey, known as al-Isra’ wal-Mi’raj (“the night journey and ascension”) culminated at Jerusalem, also known as Temple Mount. Old Jerusalem actually lies in the desert and mankind has destroyed and rebuilt it thrice in search for religious powers. I have been told that when you visit the site, you can almost feel how ‘powerful’ this place is. A city so important to more than half the world is definitely on my bucketlist. Dead Sea: You can float on water. 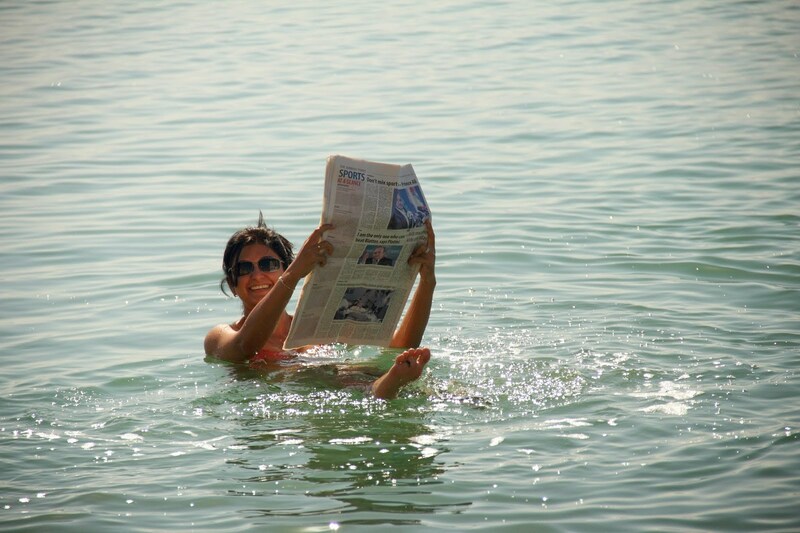 You can lie on the surface of the Dead Sea and read a newspaper. I have experienced this a couple of years ago when I first ‘bobbed’ on the surface of the Dead Sea …and I want to experience it once again. I want to slather myself in the black mud and wash it off with the salty water to reveal baby soft skin. The Dead Sea is one of the seven natural wonders of the world, and is a must have destination on your bucketlist. Water of the Dead Sea is over 8 times saltier than ‘regular’ sea water, which makes it dense enough to let you float effortlessly. It is also the lowest point on the surface of the earth, with a sufficiently thick ozone layer that allows you to get a good tan, yet filters out the UV rays well. 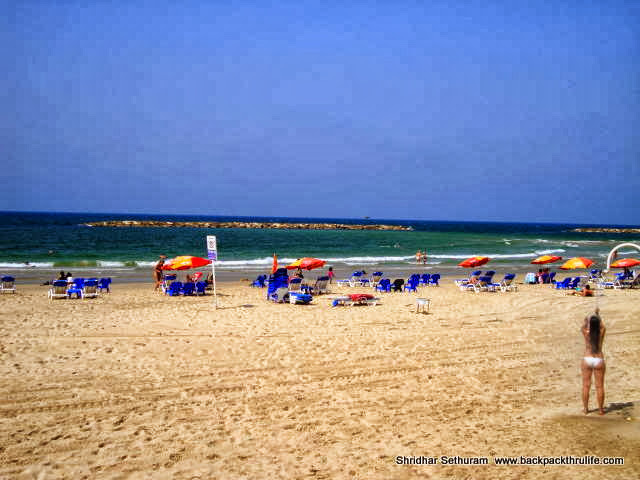 City life in Tel Aviv: Tel Aviv is situated by the Mediterranean Sea and has a coastline of over 10 kilometers. Who does not like to have fun in the sun? I have also heard loads about the party scene in Tel Aviv. The city has a rocking nightlife, with clubs that swing into the mood at about mid night. It surely seems like a city to party the night away. Israelis and locals dress up and Tel Aviv is possibly the place for me to wear my designer clothes. I have also learnt to say ‘Cheers’ in Hebrew … ‘Le Haim’…Let the party begin! Diving in the Red Sea: I have dived in the Red Sea in the past and it has been one of my best diving experiences ever. The water in the Red Sea is colder as compared to that along the equator, which, to an extent has prevented bleaching of the coral. Diving at Eilat is much cheaper as compared to Sharm-el-Sheikh (Egypt). At Eilat, sea goldies swim in a carefree manner and the area has not be run down by divers – the sea still hides treasures. Even a wreck dive is possible at the Satil wreck, which is over 30 meters long. I have never done a wreck dive, and this opportunity kindles the explorer in my soul. Food: Israel offers so much for food lovers… I stand corrected…so much for vegetarian food lovers. There is a spread of dips and varied kinds of cheese served at every meal. I am drooling at the thought of dipping some fresh pita bread into a bowl of hummus! Or maybe picking up a yummy falafel at a street food joint…or having a hot helping of Shakshouka, which is a pan fried dish made of poached eggs, tomatoes, onions, and spices, served with bread. And the wine…how can I miss mentioning wine? Fine food and fine wine go hand in hand! Wine tasting in Golan and Galilee region is high on my list! I am keeping my fingers crossed and hoping that the trip to Israel happens soon…really soon! Have you been to Israel? Is there something else that I should add to this list…I am sure there is plenty to do and see! What more should I add to this list? Yes! Israel is an amazing country to visit (I am currently living in Jerusalem). 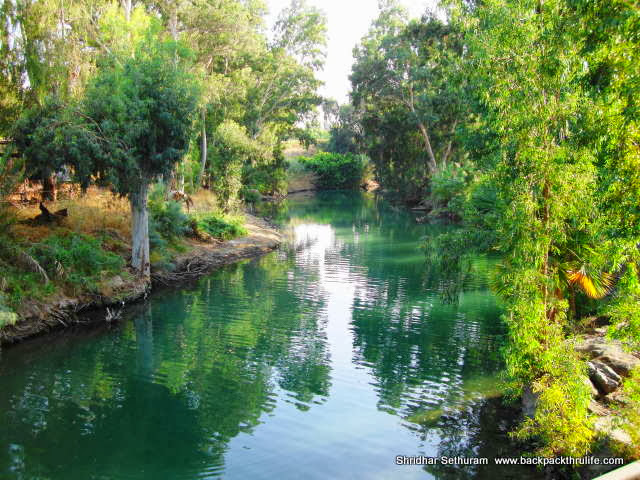 Also check out the Sea of Galilee and the Golan, especially if you’re into wine and hiking. There are some amazing boutique wineries here. I didn’t have an idea that the wine scene is so big there! How is the night life? Would love to get to Israel! When we went to Jordan we didn’t have the chance to get to the dead sea. So that sounds like a great idea for when we will visit! The Dead Sea surely is a bucketlist experience! One should definitely visit Israel, especially Jerusalem. Such a small country can hold up so much rich and profound history, that is something to be experienced in person. On practical travel note, food is not extraordinary compared to what I had enjoyed in Jordan and Turkey. And, it is quite expensive. Any clue on what the vegetarian food is like? Combination of pita bread, hummus, falafel and salad are cheapest and most easily available. But other country cuisines are there too. Super! I am sure we will be able to manage with this…I love the way the make the hummus in the Middle East…delightful! You have really opened my eyes to Israel. The Dead Sea sounds amazing and I’m all in favour of baby soft skin! Never would have picked Tel Aviv as having rocking night life! And the Dead Sea mud experience is so so so awesome! The Red Sea dives were awesome. None of the larger beings, but the coral is in excellent health. 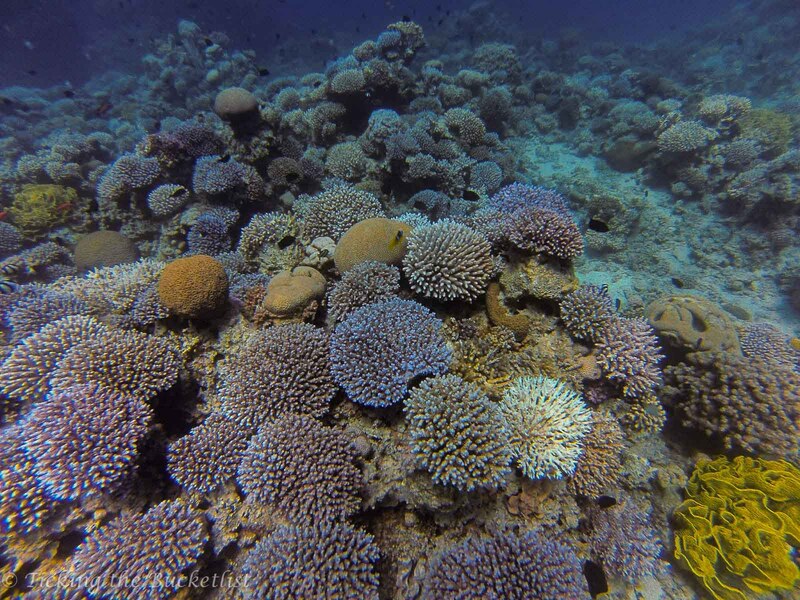 As the Red Sea is colder that the tropics, El Nino has not had that much of effect here and the corals have not bleached..they still have their bright colours. Most dives are shore dives that make diving easier. Btw, Maldives is a great place to dive… we saw manta rays and whale sharks at the Maldives! Also, I guess Israel will offer plenty for meat eaters as well…so, both of you will be happy souls! Israel is a place I have always wanted to go but have always been a little worried to. I remember seeing some clips of it in The Idiot Abroad TV programme and it looks incredible! The wailing wall, Holy land, the dead sea and the amazing food! Can’t wait to read about your experiences there! There is so much history to explore…and such a lot of reading to be done. I am sure being in Israel will be interesting, but reading about it will interesting as well! I haven’t been to Israel but I would definitely go! There’s an Israeli vegetarian restaurant right at the corner of where I live and the food is so good!! I can only imagine how good it must be in Israel…..yummy! I loved the food in the Middle East and I have heard that Israel is vegetarian friendly. Hope to be able to get here in March next year! I would love to visit Israel and take a dip in the Dead Sea. I am actually at the World Travel Market these days and I will pass by the Israel Tourism Board to find out more information about the country. It definitely looks like an interesting destination, both for the eyes and for the stomach. We floated in the Dead Sea at Jordan…it is one experience that you must not miss out on ever. Even the diving, I have heard is excellent! Please do check out the diving options with the Tourism Board, if you can do so! Israel looks and sounds fascinating. While I haven’t thought too much about it, I would definitely go! The info and photos you provided help and are inspiring! Thanks! Hey great blog in Israel .I have been planning a trip to Jordan because Petra looks so amazing and also trying to decide if it’s worth adding on Israel because the visa is tougher to get . Honestly, I think both countries are awesome and deserve at least one week each.Israel has so much to see and exprience…so does Jordan. We did a week in Jordan, and I would have loved to have 2 days more.